7 x 7 inches, 2005. 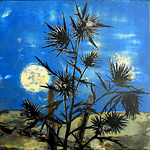 This image is one of a series of encaustic paintings based on the Bulgarian folk song "Bula Mehmeditsa (Mehmed's Bride)." Part of that series is currently on exhibit in Sofia, Bulgaria. 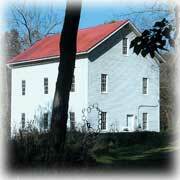 Based in Boyds, Maryland, the artist primarily creates drawings and paintings. Subjects are varied and include portraits and murals. Marguerite de Messieres, www.demessieres.com, dmmargot@hotmail.com, 301.972.8186. 11.5 x 12 inches, 2005. 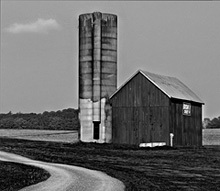 This photo is one of a series of about 40 barns, mainly in Montgomery County, Maryland, taken in the spring-summer of 2005. A number of the photos in this series (but not this photo) can be found on the "Barns of Montgomery County" poster and note cards produced by the Heritage Tourism Alliance of Montgomery County. Based in historic Hyattstown, Maryland, the photographer is primarily interested in architectural subjects, as well as interesting still life. 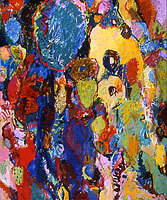 CC, acrylic on canvas, 48 x 36 inches, 2005. Each painting for me is an exploration of the creative process. Along with nonrepresentational paintings, I create abstract paintings inspired by sculptures of Neolithic Goddesses. I also offer workshops in Spontaneous Painting for anyone who wants to strengthen their creative powers. Suwannee, and Light Horse Harry Lee. the ex with the ex's ex's staph infection. but, hey, you can't have everything. Pooch by George Miller, from "The Transmigration of Souls", 2005. George Miller lives in Barnesville, Maryland where he is working on two novels ("How to Get Rid of Sludge" and "The Triumph of Beach Art") and two volumes of poetry ("The Transmigration of Souls" and "The Scent of the Ia Drang"). 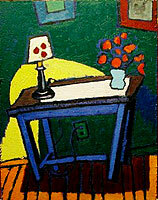 Still Life with Blue Table, Oil on wood, 31 x 28 inches, 2005. Bobby Donovan is a painter and printmaker. False Indigo, Pastel and charcoal on paper, 44 x 30 inches, 2002. Susan Due Pearcy lives in Barnesville, Maryland. and only black horses may trundle from the wake. but whose eyes never find it. The Bard by Lee Robison, 2006. Lee Robison lives in Poolesville, Maryland. He is working on a second book of poems. Ninth Chord ,Oil on panel, 24 x 16 inches, 2005. Ed Subleski is a painter from Middletown, Maryland. 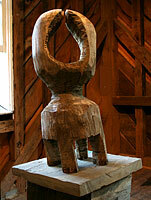 Space Man, Oiled Oak, 28 x 10 x 10 inches, 2004. 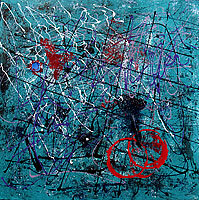 Turquoise By Choice, Acrylic on canvas, 36 x 36 inches, 2006. I like to work with the kind of random order that is found in nature, as illustrated for example, by the say twigs and leaves come to rest on the forest floor. Shown is a painting from a series called Line Paintings, works of gestural abstraction that generally involve linear fields and elements of length—lines straight, squiggley and curved, often complicated with spots, splashes and sometimes text and objects. Adrienne's Studio , Oil on canvas, 20 x 16 inches, 1994.